Beyond the (Beer) Bottle… | Hapa...Shot the Food! While many of us are content with downing a cold one (or not-so-cold in my case) with friends, beer as an ingredient is not crazy talk. When one thinks of cooking with beer beer-can chicken, quick bread, and many things battered come to mind for most. All of them are tasty, but once one leaves the American-style lager road, a new range of possibilities open up. Because beers are as different as night and day depending on how the beer is brewed, it’s a versatile ingredient. Much as I sometimes cringe about not drinking the Guinness I bought (which makes for tasty cake, I might add), Kechara reminds me: “Unlike with wine, it’s best to cook with beer you want to drink.” She has a point. Some of these recipes won’t work with Bud or Natty Boh (those two aren’t really up my alley unless I’ve already had a few). Below the jump is a recipe for sherbet and one for an entree for the grill. Yes, you can do that with beer! 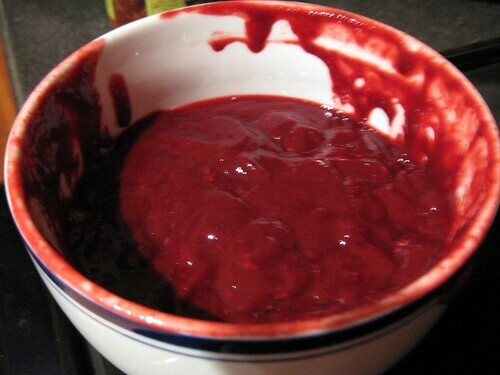 Puree and strain the berries. 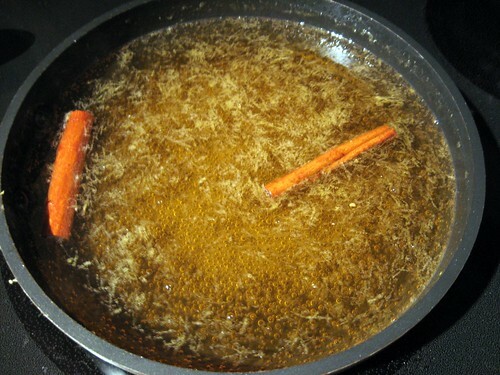 Meanwhile, in a small pan, combine White Ale, sugar, cinnamon stick, and lemon zest. Heat slowly, stirring until sugar is dissolved. Cover and bring to slow boil for one minute, then boil uncovered for three minutes. Remove from heat, strain, and cool to room temperature. Add berries, cream and lemon juice and chill (preferably overnight). Pour into ice cream maker and follow factory directions (usually for about 20-30 minutes). 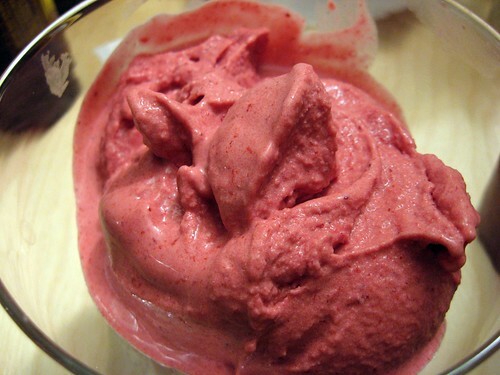 The pureed berries are below. They still needed straining to get the seeds out. …and here’s the white ale combined with the zest, sugar, and cinnamon. 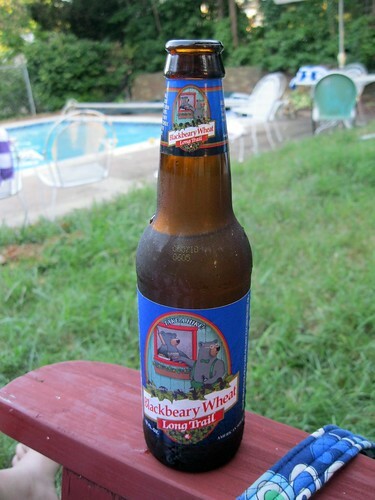 (According to Sam Adams, a Hefeweizen or a Summer Ale can stand in for the White Ale). 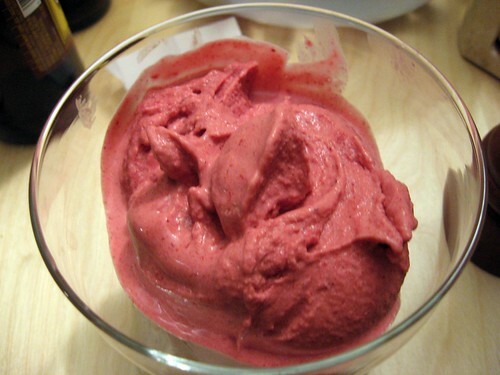 Here’s the finished product: a cool, berrylicious treat. You definitely won’t taste the beer. A closer shot of the sherbet… Yum! Directions: Preheat grill to medium-high heat. Using aluminum foil, create an oblong cooking tray (approximately 13 inches by 8 inches by 2 inches) to be placed directly on grill. Place salmon fillet in center of tray. Season first with garlic salt, sprinkle with brown sugar, and then cover with pieces of butter. 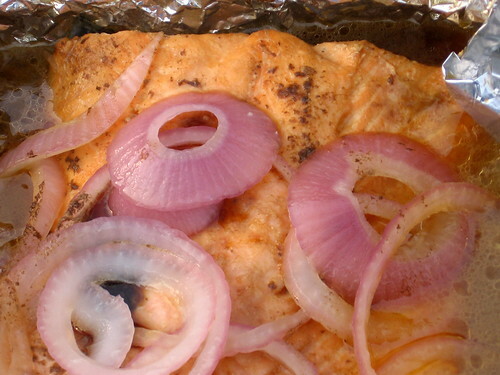 Top with sliced red onions. Pour beer of choice into tray to just below the highest point of the fillet. Cover tray with aluminum foil to envelope fish completely. Place tray on grill, cover with lid, and grill for approximately 8 minutes or until just cooked through. 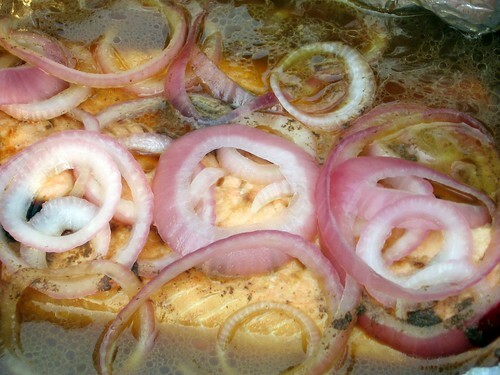 Posted on July 13, 2010, in desserts, recipe, Uncategorized and tagged beer, salmon. Bookmark the permalink. 1 Comment. A potentially stupid question: If you don’t taste the beer in the sherbet, what does it bring to the dish? Is there a background flavor? Also, I generally don’t cook with wine that I wouldn’t drink. I wouldn’t think Kechara would either, but I guess I was wrong!